Herein lies the Noisebridge Manual. 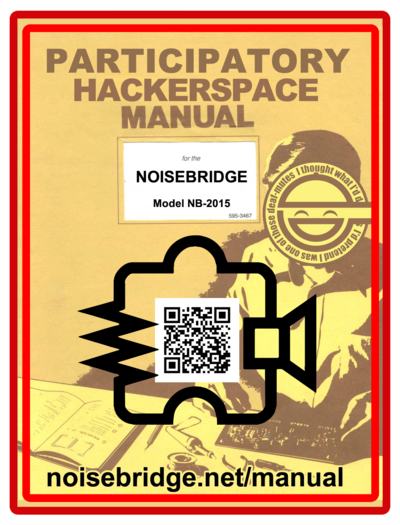 It is an ever-changing tome that strives to answer an unanswerable question: How the heck does Noisebridge really work? This is not general advice for fixing things. If something at Noisebridge isn't working and it needs fixing, then check out Help. Are you new to Noisebridge? Have you been coming here for years? Either way, you should really read up on what we're all about. Lots of this stuff is the basis for what we do. Noisebridge Vision - What's it all about? Testimonials - In your own words, what is Noisebridge? CommunityWorkingGroup - Bringing the Noisebridge community together to create a better space for all. Conflict Resolution - What to do when we don't get along. Mediation - People within the community who have offered their time, tears, and sweat to keep us all together. Slack - IRC on steroids. Invite only. Mailing list - A lot of e-mails and stuff. They've got a trove of historical archives! Safety - Preventing those old school hardhat accidents. Shims and Hacks - A list of problems around the space and how they were solved with a clever reminder or choice.